The transient growth due to non-normality is investigated for the Poiseuille-Rayleigh-Bénard problem of binary fluids with the Soret effect. 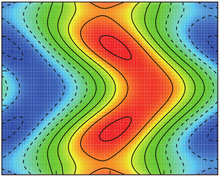 For negative separation factors such as ψ = −0.1, it is found that a large transient growth can be obtained by the non-normal interaction of the two least-stable-modes, i.e., the upstream and downstream modes, which determine the linear critical boundary curves for small Reynolds numbers. The transient growth is so strong that the optimal energy amplification factor G(t) is up to $10^2 \,\sim\, 10^3$. While for positive separation factors such as ψ = 0.1, the transient growth is weak with the order $O(1)$ of the amplification factor, which can even be computed by the least-stable-mode. However, for both cases, the least-stable-mode can govern the long-term behavior of the amplification factor for large time. The results also show that large Reynolds numbers have stabilization effects for the maximum amplification within moderate wave number regions.